NFL.com’s Lance Zierlein has posted his initial grades for the 2019 draft prospects. Here are his top-three players. Which player do you think the 49ers should take, and why? I think they should take Allen. He’s the best player in the draft and he fills a need. Avoid Alabama players, period. Not even because of Foster. While my heart tells me Nick Bosa is the surest bet, with his combination of athletic traits PLUS he’s clearly the most “polished” pass rusher I’ve seen in a long time, my eyes tell me Josh Allen is the best athletic specimen of the top 5 defensive prospects, and could have the higher ceiling, at least in theory. Honestly, I’m not ready to put the Quinnen Williams ahead of Bosa or Allen. In fact, Quinnen Williams rose a little too highly, too quickly for my blood. One great year on a college dynasty of a defense, loaded with the best talent in the country isn’t enough to crown you #1 pick in my book. In fact, I might be tempted to take Ed Oliver, if he’s close to 283 lbs, ahead of Williams, depending on role/scheme. Rashan Gary is another slightly overrated player as well, IMO. Gary seems slightly underdeveloped to me. Man, I love watching Devon White, he might just end up being one of the greatest ILB/MLB of all time, thanks to his combination of size, speed, and instincts, and I’m always a sucker for the next Patrick Willis. Can’t take a ILB/MLB at #2 though. I’m happy with Bosa or Allen, but given the choice, I’d select Nick Bosa – out of the Ohio State, ahead of Josh Allen – Kentucky, without hesitation. And I don’t just think the world of Nick as a prospect, I think he be a master class at primarily the LEO, but he can line up wherever he needs to! Same goes for Allen! Both guys have a very good chance to make All-Pro in that Saleh LEO role, or quite frankly anywhere on the edge. And that’s what this team desperately needs, cuz Solomon Thomas sure as sh_t aint that guy and neither is Marsh! Bottom line: The Niners need a dominant edge defender who can cause havoc on the edge, freeing up Buckner and company. After that they need to figure out that FS spot, and more competition at CB, though I am high on Moore, plus I was encouraged by the way Witherspoon rebounded last season before injury. Sherman has maybe 2 more very good seasons left. Bring in his boy Earl Thomas if the price makes sense, team him up with uncle Sherms for those 2 years, and let Colbert learn from him and back him up. I was for Josh Allen 6 months ago and still am. Good character player and an obvious Niner star. I posted this one the last blog but it fits better here. They just need to get their guy… they can look to trade back in round two if they need additional picks. However, this pick is too important for them to potentially lose out on the guy they feel best fills the gaping hole on the Edge. Speed, fluidity and being able to dip and bend around the corner while rushing is what is effective in the NFL. Josh Allen would be my pick. He’s not looked at as being a top 2 pick but if he’s my guy I grab him at #2. I think he has tremendous upside. Meanwhile Lance Zeurlein just ranked him at number 2. Bosa, Williams, and Allen appear to have separated from the pack at this point. Realistically, anyone of these these 3 players could go #1, and anyone of these 3 players could go #3. The wildcard, as usual, is whether or not there is a team desperate enough for a QB to jump into the mix. If the 49ers trade out of their spot, they better get a Kings ransom in return. Otherwise they ought to stand pat and take Bosa or Allen, IMO. Hmmm, so Hoyer provided intel? Smart. You called it Sebbie! Remember that evening in August of ’17? You saw great things in Hoyer–and he spilled guts also (kinda). Well, it also helped a whole lot that Jared Goff was running the Rams offense about as well as Brian Hoyer ran San Francisco’s offense. It does speak to the coaches being system guys. Well said Houston 49er. Hoyer was trash running the 49er offense. Hoyer threw passes like the DBs were the intended receiver. Guess Goff did that as well, on that pass. Well Sebbie, you knew about Hoyer’s value back in August of ’17. That evening preseason game when Hoyer lit up the night…and you gushed…..
You are either really silly or you have a crush on Seb. More of the former. Plutonium does funny things. Dude. Watch the tape of Trent Brown eviscerating Nick Bosa’s more-talented older brother in the playoffs and get back to me. Yes, I hope the Niners, and many other teams, do not make so many deals with the Patriots. Bellichick wheeled and dealed, and won a SB. By participating in the wheeling and dealing, they participated in helping Belichick win. They should shun Belichick, and make him win by himself. Funny, did you notice Hoyer throwing passes? Did he even step on the field? Brown was playing his heart out on the field, and Brady was untouched. Tri-MVP? Brady, Brown, Brian . Killer Bs, enough for everyone. Holy cow… Add their jersey numbers together and you get 97. Three short of 100. Jaw dropping cosmic! Bosa if he is thier. If not Allen. If you draft Williams then you have to trade Armstead, Thomas, or even Blair. Although I’m my opinion is a better player than Thomas and would cost less to keep. I think the best case scenario is for us to trade down because we have so many holes on the roster. I think Bosa makes the most sense. I like his motor in unison with Buckner. This is assuming we get someone like Fowler as a true LEO. I’ll make my 1st round pick, and I’ll also make my 2nd and 3rd round selections for extra credit. #2) Nick Bosa, Edge, The Ohio State – One of two elite players in this draft, and fits the 49ers defense like a glove. #34) Deebo Samuel, Flanker, South Carolina – Will compete with Bourne and Garcon for the Z wideout. #67) Erik McCoy, OG/C, Texas A&M – Will compete with a F/A and Garnett for the RG position while providing depth at Center in case Richburg goes down. I’d go with Allen as of today. He appears to have a relatively clean injury history. Core injuries such as Bosa’s can be particularly nasty over time. Recall the Eric Wright experience back in the 80s (drafted ’81). Even though he returned to start after being mostly away over a two year period, he was never quite the same after his core injury. Of course, sports medicine has continued to improve and Bosa’s treatment has promise of great success. Free agent acquisitions leading up to the draft and opportunities to trade down may change what the 9ers do. If the 49ers are locked into the #2 position they should draft Quinnen Williams and trade Solomon Thomas. CFC, did you see your boy Mettenberger backing up on the Memphis Express the other night? Ha, no. I didn’t catch any of those games. If Bosa is not there, Quinnen Williams. Those are easily the top 2 guys in the draft. Most people keep rambling about Allen. They are just tired of interior linemen being picked in the first round. Unfortunately, no one in the 49ers organization cares if fans are bored of seeing the same position being drafted. On no planet, should Allen be drafted over Williams. Fans forget that free agency comes first. I would definitely be happy if the Niners were busy in FA and signed Barr or Graham or both then turned around and drafted Quinnen. Agreed. I have Allen rated in the next tier of pass rushers along with Burns, Polite and Ferrell. A dominant edge rusher will improve other aspects of this team more than any interior lineman. Get a guy who can get to the qb quickly and those DBs suddenly look a lot better. Josh Allen first pick unless another team wanted the second pick. This is a really tough call. These are the decisions guys are paid millions to make and decisions that make or break teams over years. I’ve read and heard quite a bit on the Bosa vs Allen scouting reports. Bosa is a pure edge rusher with legitimately elite bend in his pass rushing. Apparently, he’s a reliable guy who will do his job but he’s not extra effort guy following the ball to make tackles down field. Allen is exceptionally versatile in that he can drop into coverage and he can rush the passer. He’s 1 dimensional in his pass rushing so he needs to develop additional skills to rush consistently in the NFL. Everybody I’ve heard has said Bosa is 1 click better than Allen at rushing the passer and thats the major need for the 49ers. I don’t think anyone can discount Quinnen Williams who is a pro bowl caliber player in my opinion. Williams playing next to Buckner on the d-line has the makings of a top tier defense. So, let’s say the Cardinals do something incredibly stupid with the first pick and Allen, Bosa, and Williams are all available with the 2nd pick. I would pick Bosa. He is the best in this draft at what the 49ers need the most. I am not a Nick Bosa fan. I do not respect the decision he made to leave his school early. BUT he is an elite talent that can help the 49ers pass rush right away. I agree with this take. If he is taken I try to trade down and pick Allen or another similar player. I’d you can’t you take QW and trade Solomon Thomas. Many are saying trade back for more picks. But I heard there’s an obscure rule stating another team has to agree to a trade. That also includes trade terms. Many are confident Bosa will fall because the Cards will play 3-4 defense. Moving to a 3-4 moves the needle slightly away from Bosa. But the Chargers ran a 3-4 when they took Joey Bosa. Teams run hybrid fronts, play fewer snaps in base. I’m not reading too much into a 3-4. I’m leaning Allen or Williams. I have no clear favorite yet. Either way the first round will likely leave me with a blah feeling. A number of fans will be outraged Lynch didn’t press the red “Trade Back” button hidden under every NFL GM’s desk. Whaaaaaat? We fans can’t manufacture our own reality and hold others accountable for it? Im just putting what Shannahan says, that doesnt mean if lynch has a stanford draft crush he wont draft them, but they may have learned something from drafting thomas also. But Shannahan has stated what I put previous and I myself also find it a red flag as to Bosa’s lack of college experience and unwillingness to finish his junior year, regardless of his talent. Some GM is going to lose their job in the next few years for selecting him. Gonna be a huge bust in the NFL. Should have chosen baseball. You are 100% wrong. Kyler Murray and Dwayne Haskins are both future HOF QB’s that will lead their teams to multiple SuperBowl wins. I hope every NFL GM is reading this blog and understands that trading multiple high round picks in exchange for the #2 pick to draft a future superstar QB is absolutely worth it. I expect the Patriots will take Murray if he’s available. I think the Pats take 6’5″ Daniel Jones a pocket passer, not the 5’9″ 190lb Murray. Haskins goes top 10, then Murray at #8-13 and possibly the Pats at the end of the 1st with Jones. Kyler Murray has just hired Erik Burkhardt of Select Sports Group, who coincidentally also represents the head coach of the Cardinals, Kliff Kingsbury. No way in hell is Kyler Murray 5’9″ unless he’s grown 2-3 inches since high school. Mel Kiper thinks Murray is 5’9/5’9.5″ ..listed at 5’10, but he’s small. Here’s a clip of Mel predicting Murry going after Haskins, Haskins going early and Jones going late 1st. Murray looks really small in the shoulders and probably 5’9 but he’s short standing next to 6’1″ Stephen A. Smith here below. He looks tiny sitting in a big chair. Similar to the Edith Ann skit Lily Tomlin used to do. I am a huge Sooner fan. And Murray isn’t fit for the NFL game. I can see him landing on a bad team and it wrecking his growth as not just an NFL Qb but of QB. He’s still very green. I’ve seen him wet the bed in big situations and get confused with certain schemes. If the receiver is not wide open he hasn’t throw them open. In fact when he tried is when he failed. He is your typical College scheme QB. Loved him at OU but thought he’d never make it in the nfl with success. He’s no Mayfield. If he goes top 3 he will be a bust. I saw Murray play the state championship game his senior season at Allen High School. He was very small for a high school QB. He was the 2nd best high school QB I ever saw play. The #1 QB I’ve seen in high school is Charlie Brewer from Lake Travis currently at Baylor. Both guys are undersized but great QBs at the high school level. IMO there is no way on God’s Green Earth Murray can be successful in the NFL. He fell into the perfect system with a dominant o-line at OU. Having said that, I hope someone loves him enough to give up the farm for the #2 pick to get him. The only way that happens is if an owner like Danny Snyder gives his GM an edict to take him to create a buzz of excitement that they believe is sorely lacking. That owner would be Stevie Ross…. What does the trade value chart say for the 49ers to make a trade with the Dolphins? 49ers get #13 pick, #48 pick, and next years #1 pick? In a depressed quarterback market that would seem to be about the best case scenario. If Bosa is there, then the 49ers have to take him. If he isn’t there, then they should trade back if possible. While Q. Williams and Allen could be immediate impact playmakers, Williams is better suited to playing the 3T, which is a position the 49ers already have a perennial playmaker at, and Allen is better suited playing SAM, a position that does not normally addressed with the second pick of a draft. Josh Allen for what ever reason it did not click foe me when Bosa was interviewed on Kubrick, seemed to polished, Allen seems to have more pizaz and enthusiasm for the game. I was able to interpret these feelings correctly. Loss of essence. I can assure you it has not recurred, Mandrake. Women, er, women sense my power, and they seek the life essence. I do not avoid women, Mandrake…but I do deny them my essence. Colonel! Can you possibly imagine what is going to happen to you, your frame, outlook, way of life, and everything, when they learn that you have obstructed a telephone call to the President of the United States? Can you imagine? Shoot it off! Shoot! With a gun! That’s what the bullets are for, you twit! Okay. I’m gonna get your money for ya. But if you don’t get the President of the United States on that phone, you know what’s gonna happen to you? No he’s not, he’s a Cancer. His tape and the analyses on him show that he is inconsistent at setting the edge against OTs, so putting him at LEO is asking for trouble. It was never so obvious than his tape against Georgia. He was literally road kill in that game. Where is this narrative coming from? I’ve watched that tape a few times. It’s not like he stood out but they weren’t exactly running over him… they typically ran underneath him on the occasions he was tasked with setting the edge, some backside pursuit would have really helped. He’s not Joey Bosa who is a true DE but he could potentially play the LEO and would hold up fine if the backside pursuit gets there. I must clarify that even while I believe he could play Leo, I think he should play the Sam. Part of what makes him special is his ability to erase TE’s and running backs. Placing Allen at SAM would give the team more flexibility on base downs, he could cover or blitz and is very good at doing either so teams would need to account for that… additionally I don’t think there is a TE in today’s league that could dominate him in the run game should they chose run to the strong side. Shoup, Allen at 2 would be a huge reach for mine because Polite or Burns offer more as pure pass rushers. Polite would play the same role as Allen, whereas Burns to me is more of a DE. Having said that, I’d be happy with any of those three. Yeah thats where we disagree, I like Polite or Burns but to me they are are late firsts to early seconds that have a ton of boom or bust potential. With Allen I think worst case scenario we are looking at a borderline pro bowl SAM backer and that’s if his pass rush skills don’t translate as well as we would like. If Polite or Burns pass rush skills don’t translate, they are completely useless. He’s not a finished product, but no college player is. Allen has the tools to become a quality edge-setter, as Zierlein pointed out. I won’t deny that Allen has the tools, but it begs the question of why he still is inconsistent against OTs after four years. That would be the elephant in the Grant/Zierlein room. Yeah, the gospel according to Zierlein is too unstable for me. This was his “take” just last week. Sure, he’s still promoting Allen for the 49ers pick, but it’s his recent valuation of Q. Williams and Bosa sans Gary, whom he propped up last week that puts Zierlein on shaky ground. After last year’s draft the only thing we’ve learned about the 49ers is that they will not listen to the draft pundits or the fans. Personally, I see them trading down for more picks, but that’s not gospel either. 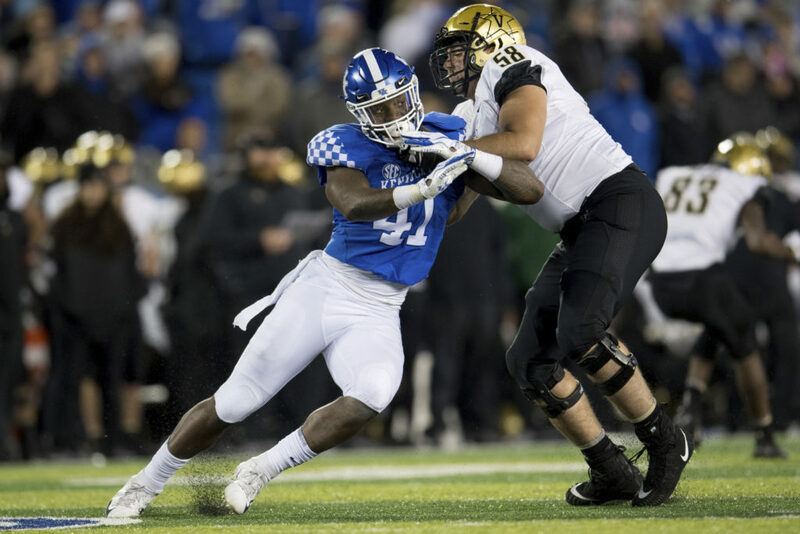 Josh Allen is the darling of NFL mock drafts right now, even though the talent disparity between him, Burns and Polite is minimal if any at all. In my un-expert opinion, Burns is a better pure pass rusher than Allen right now…. Allen was more consistent than Bosa. Some are going to eat their words. Considering he had one of the highest pass rush grades ever given out by PFF this past season and had at least 1 sack in 10 of his 13 games I don’t see how you can say he was inconsistent? Its not like he struggled against Florida’s Jawaan Taylor, PSU’s Ryan Bates, or Missouri’s Paul Adams all of whom are NFL prospects. I understand he is not the most Ideal player ever (Myles Garret came out 2 yeas ago), but I don’t get the narratives being pushed that he’s inconsistent, or gets pancaked in the run game. They are simply not true… the bigger questions are, Can he develop an inside counter to his speed rush? Does he have enough speed to bull collapse the pocket? Is he actually that good in coverage or are the SEC qb’s just that garbage? Niners should trade back, garner more picks and still get the player they targeted. I propose 3 trade backs. They should trade back with Gruden, who will covet Kyler Murray. The Cards are almost forced to select Bosa, the best prospect in the draft. Therefor the Raiders will want to get ahead of the Jets, who will have learned from their Colts trade, and be looking to trade back to get more picks, themselves. Gruden will give up his first and second, and a 2020 second round pick, to move up and select his QB of the future. Then he will trade Carr, and recoup those picks. The Niners should trade from 4 with the Jags. I think they will covet Dwayne Haskins, who the Giants like. Jags will offer their first and second, along with a 2020 third round pick. Thus far, the Niners have traded back 5 spots, and have garnered 2 additional second round picks, and 2020 second and third round picks. Murray, Haskins and Lock have been selected, and some later team will covet Daniel Jones. I am thinking Miami, with Tannehill on his way out. The Niners should trade back with Miami, who will select Jones at 7 to leapfrog over Detroit, Denver, Buffalo and Cincy, all teams who may be looking to improve their QB situation. Miami will give up their fist and second round pick, along with a 2020- 4th round pick,to get the QB they covet. In the end, the Niners move back 3 times, 11 spots, and get 3 second round picks, and 2020 second, third and 4th round picks. So here is my 13 spot mock. 1- Cards take Bosa DE. 2- Raiders take Kyler Murray QB. 3- Jets take Jawan Taylor OT, to protect Darnold. 4- Jags select Dwayne Haskins QB. 5- TB selects Jonah Williams OT, to protect Winston. 6- Giants select Drew Lock QB. 7- Miami selects Daniel Jones QB. 8- Detroit selects Josh Allen OLB. They are fortunate he falls so far. 9- Buffalo selects Quinnen Williams DT, since both O linemen are gone. 10- Denver selects Greedy Williams CB.They need to upgrade from Roby. 11- Cincy selects Devin White LB. Biggest need on their website. 12- GB selects Rashan Gary DT. Some think he will go top 5. 13- 49ers select Clelin Ferrell DE. They also could select Montez Sweat, Jachai Polite or Ed Oliver, if Ferrell is gone. Niners, by trading back 11 spots, will end up with pick numbers- 13, 35, 36, 38, 48, 67, 97, 182, 219, and 3 future picks in the second third and 4th rounds. Four players in the first 38 picks, and seven players in the first 100 selections. Niner mock draft selections 2019, using 3 tradebacks. Exploring the possibilities. 35- Nasir Adderly S. Earl Thomas type single high safety. 36- Te’Von Coney ILB. Replacement for Foster. Would like to see a WR in the mix, but I could live with that especially if we acquire a very good WR via FA. Thumbs down for Kaden Smith. Jace Sternberger is ranked 125. Gentry is ranked 99, and TJ Hockenson is ranked 82. If Sternberger is still on the board in the 4th round, it would speak to the depth of the position. Day 3 is when I’d expect the 49ers to address the position and not before…. I did see Doss in your mock, but I don’t see him making an immediate impact. He could get on the field in his rookie season and perhaps open some eyes which would be nice. The troops are losing patience around here so waiting on players to develop no longer fit their logic. Immediate impact is the new normal. IMHO, Keelan Doss will take the league by storm, make the Pro Bowl, help win a SB, and take his first steps towards the HOF. My son is a huge fan of Doss as well. And Doss looked good in the Senior Bowl. And he definitely garnered some attention the week leading up to the game, so we’ll see. AES, I am hoping the Niners sign a grizzled battle hardened veteran Free Agent, too. Tyrell Williams would be my first choice. Cordarelle Patterson, Chris Conley, Cody Latimer, Adam Humphries and Martavis Bryant may be solid options. I’ve always liked Bryant but he has never equaled anything close to his numbers in Pittsburg. And he seems to wear out his welcome after two years on a team. Patterson has become more of a Special Teams player than a WR these days. Conley has never found his niche. T.Williams would be my choice as well, but I’m not convinced that he could be a #1. I chose those players because I think they will be available. Better FAs will probably be retained by their teams. Chargers have Keenan Allen, Travis Benjamin and Mike Williams, so I think the Niners can out bid them for T Williams’ services. They would still have 2 more first round picks. Gruden wants to make a big splash heading to Las Vegas. In an interview, he was practically drooling over Murray’s skillsets. I like this scenario, albeit mildly insane and completely unlikely. I still like where your heads at. What are your thoughts on making a play at TJ Hockenson? With all these extra picks it would be awful nice to have a second TE that can block and light up a defence. thoughts? Thumbs up for Hockenson, but they’d have to use a 1st on him. Insane depth at the position in this draft, and a 3rd round prospect I like is Jace Sternberger from Texas A&M. I know it’s not a realistic pick, but if he somehow dropped to 36 I’d be banging the table to take him. Josh Allen should be the pick cuz he’s more flexible position wise, also Bose had a serious core injury, also Williams is a bad idea cuz we our stacked inside. Reid proved his worth. Niners let him walk away for nothing. No opportunity left behind to take a swing at the Niners’ FO, however ill-advised. I thought it set you free. Reid was signed late. If he was that popular he would have been signed earlier. The Niners were not going to get much for him anyway. Better to let him sign with a team he wants to ensure good will precedents with other potential players. Besides lets see how he does this coming season. I have a suspicion that Reids production drops because he now has a multiple season contract and can go back to playing cautious. Reid plays better when he is aggressive. Thats his game, but he is also afraid of concussions but to get a new contract he had to forget caution both last season and the season before with the Niners. Yeah, maybe they want to “kick” the tires. I think its funny how so many people get worked up over 3-4 or 4-3, when the reality is that it’s basically only played around 30% of the time. The edge rusher which plays in most nickle and dime packages will be on the field plenty, so it makes sense not to worry about it… and I don’t think the Cardinals will. In the case of Allen he would play the Edge in Nickle or Dime situations replacing Marsh, or in base, replacing Nzeocha or Smith. Not only is it not used all the time but it is extremely dependent on your talent at key positions. You can stick religiously to your base scheme and when they do poorly, blame it on personnel and do the wait until next year trick. Or you can do like the good teams do and utilize the talent you already have. I still believe that, just like you have to have alternatives to your base defense, you should be flexible enough to run both a 3-4 and 4-3 depending on personnel. Offenses run out of all kinds of sets. But having both a 3-4 and 4-3 in your bag of tricks is just too much for he defense. I will never get it. Nolan and Singletary ran both. Yes, I know, they got shown the door, but it wasn’t because the defense sucked. And with the second pick in the 2019 NFL draft the San Francisco 49ers select…. pause for the opening……..
Josh Allen from Kentucky lime ninermd has holes and called in the beginning. Said it then and I’ll say it now. IMO he is the best fit for this teams needs. Hybrid, can play the edge as well if not better than Bosa, takes care of two positions when switching the scheme, covers better and doesn’t have the durability concerns I have for Bosa. A can’t miss season and with their first FA signing being Earl Thomas adding Allen would take this defense to a higher level instantly next season. Like Mack I personally haven’t seen a top ranked prospect line Allen since. We didn’t land my old draft crush, but this year the opportunity is right there! They take it, and land a future HOF player. He’d be my 3rd choice, but I’m sure Saleh will use him to throw a wrench in opposing offenses. If I had to stay at 2 I would choose Allen over bosa if the two were available. Bosa is overrated in y opinion and I don’t want injured players or ones that don’t play for their team. Still think we need to trade down at least twice to get picks this year and next year. I don’t get the love for Allen. He’s very good, but he’s not one of the best two players in this draft. 49ers should take Bosa or Williams, or trade back. Agreed, but without a red trade back button, what’s a John to do? No on Williams. The team already has a great 3T, so drafting Williams is overkill. Bah, I think our defensive lineman are versatile enough to be able to accomodate Williams just fine. It is overkill Razor. Buckner did most of his damage at the 3T, and that is where Williams is best suited to play at. Unless Williams is an upgrade over Buckner, the 49ers should not draft him. “The cool thing with the way the front has been built in the past, they are very versatile,” Saleh said. “So you can do anything, we can do anything we want with them. They’re not traditional. When you look at Arik Armstead and DeForest Buckner, they are very, very unique in the sense that they can play up and down the line however you need them to work. He still is overkill Razor, especially considering that the team needs an edge more than anything. That is where Shanahan and Lynch’s career with the 49ers will be if they miss out on signing a LEO in free agency and draft Q. Williams instead of the needed edge rusher. Saleh’s statement is BS, it’s called coach speak. IF if it weren’t, we wouldn’t be looking for an edge rusher. Patriots found smart players who showed versatility, so those are nice traits to have. Allen is better than Bosa, and Zierlein agrees. Granted I’m no expert, and Zierlein is never wrong but I feel like Burns is the better pure pass rusher over Allen. Basing your conclusion off one analyst is not a sound argument. Grant is the expert, so I’m not sure he needs Zierlein to bolster his position that Allen is better than Bosa. As ridiculous as that sounds, I’m sure it reads moreso…. You love tweeners with tight hips such as Nick Bosa and “King” Solomon. I have not seen anyone label Bosa as a tweener. I disagree, and so do the majority of draft analysts. Anyone with access to YouTube is a draft analyst these days. I put more weight into the NFL’s official draft analysis. If Zierlein ranks Allen ahead of Bosa, I take that seriously. Let’s wait until after the Combine before making any pronouncements. Some player will jump off the charts. Bosa seems to be the number one pick, but he may not test well. I agree with Razor’s assessment of Josh Allen. He did not shine in the Georgia game, going against solid competition. Eastern KY, Vandy, Central MI, Murray St, Middle Tenn, helped pad his stats. I am thinking Kyler Murray will go top 5. Bosa may not even be an edge rusher in the NFL. Zierlein compares him to Michael Bennett, who’s an edge run defender and an interior rusher, like Solomon Thomaas. Um, that applies to you too Sebbie. None of my mocks are set in stone. “Set in stone ” means little now days. What would matter is if they were written on a piece of paper in a sealed envelope. Eastern KY – He didn’t play them last year. Middle Tenn – They played in the championship game for Conference USA so they were pretty good last year. That said even taking away those games 4 games… He would have had 12 sacks and 4 forced fumbles which is still better than Burns, Polite, or Ferrell put up last season, and that’s before taking away their “padded stats” against lesser opponents. If the guy’s name were Rick Sosa and he played at Tennessee, people would see him for what he is. Meh, I’m not a fan of just basing things on stats. Bosa’s film is very good, very consistent, no matter the opposition. Equally good against the pass and run. I don’t think he’ll ever be a 15-20 sack guy in a season, he’s not dynamic enough I don’t believe, but the type of guy that will consistently get 8-12 sacks barring injury while providing strong run support and generally being a tough matchup for the OL throughout the game. Allen would be best suited to playing as a 3-4 OLB imo. Which he would effectively be able to do as a 49er – play the SAM in base and Leo DE in nickel. He provides great value in the multiple ways he can be used. But as a pure pass rusher, I think he might take a little while to become really good. Too reliant right now on one move. I wasn’t basing my position on stats alone. I was using stats to bolster my argument. One of Allen’s better games was against A&M and he didn’t have much in terms of stats but he provided consistent pressure and had a pass breakup. Don’t get me wrong, I would chose Bosa over Allen. I was talking about Bosa’s numbers versus lesser talent only because Seb was arguing that Allen’s numbers were inflated by lesser competition which I find to be a bogus argument. Shoup, Allen was afraid to go against Senior Bowl talent. Why? Because he was afraid that he would not do very well against linemen who are projected to be drafted in the NFL. They might expose his weaknesses, so it was not a profile in courage. I want a player not afraid to go against stiff opposition, to showcase his talents. If he bails on any combine drill, I will say that he is listening to bad advice. Allen did well against far better talent than what was in the senior bowl… so I don’t think he was afraid of that. I think he might have been advised that as a sure top 5 pick he would be smarter not to risk injury in such a meaningless game. Playing while being afraid of injury, is a good way to get injured. Meaningless game? Several players just got a big paycheck, based on their performance in the Senior Bowl. Nasir Adderly might be a first round pick. Deebo may not have caught many passes in the game, but he showed separation in the practices. Daniel Jones may be a first round pick after he won the Senior Bowl MVP. Allen can handle TE’s but OT’s give him some trouble. I’m not suggesting Zierlein’s analysis shouldn’t be taken seriously. But most analysts, including serious analysts, don’t agree with him. Those guys should also be taken seriously. All that aside, both you and I will watch the tape that is available and form our own opinions. I know I am just a casual observer, but end of the day I won’t force myself to agree with a take I don’t see myself. And I am sure my takes will often be wrong this year, just like in past years. But, be that as it may, from what I have seen of Allen I don’t see the player many others appear to. Very good, but not great. But, be that as it may, from what I have seen of Allen I don’t see the player many others appear to. Very good, but not great. I agree, and Razor keeps believing that Thomas is better than Ronnie Blair WHICH HE ISN’T, Thomas is perfect for trade bait along with Malcolm Smith, and Derrick Celek…Josh Allen fills in a straight ‘flush’, and Burns might still be available later…. Blair is way better than Thomas. What do you think Thomas could get the 49ers in a trade? Not much… maybe a 4th or 5th rounder. At this point the team is better off hoping he improves. I agree. Probably a 5th at best. Keeping him in the rotation may be the best move for ’19. Give Thomas another year to figure it out, and maybe there’s enough words to eat for everyone. Scooter…. Bosa sat for a year. How on earth can you call him one of the best 2 coming out? Hype my man. He may be great. But to stamp it like it’s fact is funny. Allen gonna make you guys eat your words. Whether he’s with San Fran or not. Bosa gonna make you pee your pants, whether he’s with San Fran or not. Lol! I can’t say Bosa is one of the best two players in the draft but you can claim Allen is going to be future HOF player. Ok. SMH. Scooter…. now you’re getting it. Definitely Allen, but needs to be paired with a free agent, or maybe Kentavius Street is the guy, but they must have two or whoever they take will find tough sledding. The Niners desperately need an edge pass rusher. I don’t know if Bosa or Allen can give the team at least 10 or more sacks a year and create disruption in the other teams backfield. However, this is what the Niners need who ever they pick to do. They should only trade down if they don’t believe who ever is available at 2 can’t do this. The team needs pro bowl level talent not just talent upgrades. While it would be great to draft a Fred Dean or Charles Haley they must get at least a player who the other team must game plan against. This will change the entire defense; open pass rush lanes for the other front 7 and make the backfield more productive. A miss in this draft and in free agency will keep the team in the bottom half of the league for another two or more years, so no pressure on John and Kyle; right. Agree that we need the type of player that opposing teams must plan against. Interestingly is the fact that Fred Dean was drafted in the 2nd rd, and Charles Haley was drafted in the 4th rd. Our best Edge might be picked outside the 1st rd. Like Haley, maybe we strike the motherlode again. Bosa gives us the best pure pass-rusher in the draft. Allen gives us more versatility. My list of the top pick at #2 is still in this order. None of the top five highest paid QB’s made the playoffs. 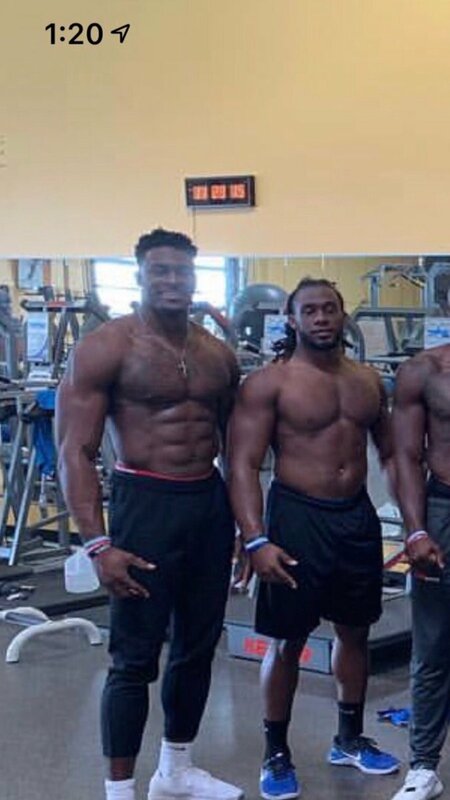 Anyone else seen the photo of DK Metcalf today? That dude is huge. If he tests like he is expected to he will go higher than a lot of people are currently thinking. Dude’s been putting in the work. If Grant can grant me access as the Press Democrat combine reporter, I’d make the 2 1/2 hour car trip to the combine this year. For those who have not seen the DK Metcalf photo, he’s the last one on the left! He’s a physical beast, but I was surprised to see that his stats didn’t align with his imposing size. The kid does look like a possible RZ terror. He will need to add more leg strength because once in the league not many defenders are going to want to tackle him high. If he can add 15-20 lbs without effecting his speed and lateral movements, he could be used in a two TE alignment on occasion. Can we have his trainers? Sorry, I didn’t see your photo before posting….I didn’t mean to step on you…. No problemo. Dude is ripped like a rock! Turn him into a pass rusher. PLAN A: Bosa or Allen. Most likely Bosa will be gone. So Josh Allen at #2. PLAN B: Acquire Trey Flowers from Pats, and draft Q. Williams. Oh to hell with it, just let’s take the best punter on the board with the first pick. That single act alone would unite this blog–for a week at least. And, Grant would finally work up the nerve to get that interview with Denise and delve to the bottom of all 9er buffoonery. Once exposed on the national stage for what they are, the Yorks will sell. New owners, GM and HC booted, 9ers in playoffs by 2020. And the selection of the punter was the trigger. Take Josh Allen and sign Anthony Barr. Once we have these 2 talents, one on each side of the line, we know Buckner is going to cause trouble up the middle and maybe Thomas finally starts producing as well. Then we still have Street and Taylor who can get an opportunity to play and hopefully improve our pass rush and run stops, as well as start creating turnovers. This should also improve our D-backs performance. But I’m still not sold on Saleh. I recommend they draft someone who fits into their scheme or system and who they can properly develop to be a significant factor in playing better football. I thought I would try something new here. If we go by last year, and all the stymied predictions made here and elsewhere, I fully expect the Niners to pick none of the above. Who is the highest rated OG in this draft? Cassie’s prediction is as good as any. I haven’t watched enough games by these players three to have any opinion. I will rely on the folks here for answers to my questions. As we are aware, any defensive star can be neutralized in a play-off game. Niners need to have decent edge rush from Leo position, as opposed to having almost none this year. NFL passing offense is changing in the direction of quick throws and away from the 5-7 step drop backs. Hence, interior pressure is going to be increasing important in getting QBs out of rhythm and making them throw before the route is run completely. Is Williams a game wrecker to the extent that Niners must move on from Thomas now? A team has to be careful drafting an edge rusher whose key strength is speed and has maybe one or two moves. Production in college in terms of sacks can be a little misleading because these athletic rushers can get around the tackles. Not so much in NFL where they will be stymied by the likes of The Legendary TB77, The Grand Protector of TB12 ;-) Did Allen win in college with one speed move like Bruce irvin? Finally, Bosa seems to be the best pure pass rusher with superior technique, but does he hustle enough after the ball carrier or will just be a pass rush specialist? If Bosa is gone, do they need to “overdraft” Allen at #2, move on from Thomas with Williams, or just trade back if possible and try to get a “boatload of picks”? I don’t understand this idea of Williams cancelling out another starter. All our defensive lineman are cross trained up and down the line, and rotation is emphasized. For the sake of argument, let’s say we sign Ansah. We’d have Thomas/Buckner/Williams/Ansah, Armstead/Buckner/Thomas/Ansah, Ansah/Thomas/Williams/Buckner, etc. Drafting Williams doesn’t preclude us from drafting an edge rusher with our 2nd-rounder. Would it be ideal? No but it certainly isn’t a hand wringer that some seem to be inferring either…. Long ago we had a play when I was in junior college that has since been used by major colleges. I’ve seen it more than once. I’m not sure but I think that Harbaugh used it once at Michigan. Before the snap all of the lineman shift to one sideline and two receivers split out to the other sideline. The only thing left in the middle of the field are the center and the QB. While it is not a play that can be run except as trick play, it demonstrates something about rushing the passer which is easily forgotten. The quarter back lines up so far from the center that it is impossible for any rusher running UNTOUCHED to get to the QB before he gets rid of the ball. When we practiced it, we lined up our very fastest RBs who never came close to touching the QB. Depending on the defense’s response to the shift, the QB can throw to one side where the tight end drops back behind 4 blockers or throw to the other where one split receiver drops back behind the other. In the real world, if you have not seen the play before, the defense invariably leaves several players to try to rush the passer which is futile and creates mismatches on either side usually for a long gain. My point is that there must be coordination between the defensive backs and the pass rushers or sacks may become impossible. Saleh’s loose zones make it extremely difficult to keep the QB from releasing the ball so quick that even a fairly good pass rush can get to the QB. Hurries and hits maybe, but sacks are much more difficult. Dreaming of a player that is going to change this is by himself just that, a dream. Football is and always will be a team game. If the DBs can’t make the QB hang on the the ball longer, you’re going to need a rusher that has not yet been invented. The 49ers could create more sacks by just having a couple of decent CBs who play more than loose zones, and adjusting their defensive scheme to take away the quick releases. Nick Bosa and Aaron Donald were non factors in the playoffs because of Brady and their offensive scheme. If you think that any of the heart throb rushers in the draft are better than those two then you go for it. I’ll repeat – football is still a team game. With the first pick in the 2019 NFL Draft the San Francisco 49ers select: TE Kaden Smith, Stanford. When asked for comment, John Lynch said – He’s from Stanford. He exceeds all my expectations with the way he moves out there. He’s from Stanford. He’ll bring quality leadership to the locker room. He’s from Stanford. With his size and strength he will bring a versatility to this team that we so desperately need. Offense? Defense? Doesn’t matter. He’s from Stanford. He was a top guy on my board and I heard many other teams were interested in him, so I pulled the trigger… and no I don’t believe this was a reach because he’s from Stanford. Any one of the three would help our defense. Hopefully we sign a solid safety and get Antonio Brown. A conditional 6th round pick for Antonio Brown, and I’m all in! I think Bosa will go number one, which means its Williams or Allen. I think Williams can be the pick if he really is the sure thing alot of scouts seem to claim. That’s nonsense that the 49ers would have to trade somebody, a deep rotating DL is highly coveted. Also Interior pressure disrupts offenses and QBs more than anything. I’d be ok with Williams as long as the EDGE is addressed in free agency, hopefully with multiple players. The more the better. Metcalf looks like He-Man about to take over the NFL universe! You take Brown, I’ll roll with Metcalf and we’ll let the chips fall where they may. By year 3, DK has a chance to be one of the premier wide receivers in the league…. Trade back with raiders. Then take any of the top 4 pass rushers left. Too many holes for 1 guy to make a difference. I did see a trade scenario where Jacksonville traded their cb and we flipped #1s. That seems like the best case scenario. I would prefer Allen. QW is a no. For a straight pass rusher Bosa is the pick but has injury concerns. Allen has the versatility the 49ers covet as a very good pass pusher but also can play in space well, Im starting to lean towards Allen as my pick for those reasons because i see khalil mack vs Joey Bosa… who would you pick?? Last April the players that were bandied around here as our possible first pick were Harold Landry, Tremaine Edmunds and Roquan Smith. R. Smith had very nice numbers with 121 tackles, 5 sacks. Harold Landry’ line was 24 tackles, 4.5 sacks. Tremaine Edmunds finished at 121 tackles, 2 sacks. Not bad for rookies. But there was a big drop-off when compared to Bradley Chubb’ numbers at 60 tackles, 12 sacks. I see the same drop-off between J. Allen and Nick Bosa. Bosa will give us 10-12 sacks ala Chubb. And this defense has been pinning for those sack numbers since the days of Aldon Smith. If he’s there at #2, there’s no way we pass him over. I agree. Who they can sign in free agency will change the draft dynamics. Its a bit different though in that Justin Smith was a DT (mostly played 3T for the 49ers), not really a DE. Bosa would be a DE in a 4-3 with 3-down ability. I don’t think it matters what type of edge guy they bring in through FA (3-4 OLB type or true 3-down DE), he can easily play the other spot no problem. Allen would likely be a 3-down player also though for the 49ers. He would likely play the SAM in base, and DE in nickel (so most of the time). Both are really good players and I would be happy with either being a 49er. But I do think Allen is a bit overrated as a pass rusher. He’s an excellent speed rusher, but doesn’t have much else in his bag of tricks. Nick Bosa isn’t half the player Justin Smith was. And Smith was a pure DE at Missouri and with the Bengals. Smith was a really good strong side DE in a 4-3, but he didn’t have the get off or bend to be a dominant pass rusher. It wasn’t until he moved to the 49ers, bulked up a bit and played primariy as a 3T that he became a great pass rusher. Bosa is a different type of player. Bosa may have to move inside, too. He has tight hips and doesn’t bend well. I don’t understand this analysis. He bends just fine. Bosa bends, tilts and trims like nobodies business but Grant may be one of those guys that like bone in wings but not boneless…. Sure, about as well as Justin Smith could bend at DE. Grant instead of coming off like you’re a guy that enjoys hard tacos but not soft, can you provide video evidence to support your claim that Bosa cannot bend? Hips look more than adequate from my layman’s perspective. But I enjoy ribs on the bone as well as boneless ribs…. I’m curious where the Niners will want to play Allen: DE or SAM??? We don’t need another tweener. The book on Allen is that he is versatile. If he can excel at both then I say take Allen. Otherwise if Bosa is hands down the best edge and that’s what we need and that’s what we will ask of him…with no injury concerns, we should grab the Fort Licky alum. If we sign a power DE, like Frank Clark or Brandon Graham, I would hope the pick is Josh Allen. That way you start both; Allen at SAM who drops down to LEO during passing situations. If we sign a speed DE, like Dante Fowler or Dee Ford, then the pick should be Bosa. Thomas has enrolled his children in Texas. Somewhere Hammer is rejoicing. Its certainly an indicator of where he will play next season. But many players have their family set up away from the team they play for. Fair point, Scooter but why now is the question I keep asking myself. Yeah, in all likelihood it is a strong indicator of where he will be playing. Is there a trade in the making? I think Allen’s versatility sets him apart. Plus I think Kocurek can coach him up and improve the inside counter move, that so far seems to be the biggest knock against him. If a trade down scenario presents itself it would be hard to pass up. The Niners could still get an edge rusher down the line or a player like Devin White. Ultimately free agency plays a major role in the direction of this pick. What are people’s thoughts on TJ Hockenson? I realize with Kittle being their best weapon, most people wouldn’t be looking at TE early in the draft, but pairing those two could be a matchup nightmare for defences, and from what I’ve seen Hockenson looks like a beast. I wouldn’t want him with #2 obviously, and he’ll likely be gone before #36, but in Seb’s multi tradeback scenario I think he could a nasty little addition and perhaps an answer to the redzone woes. Polite can do the same things Allen can but is a better pure pass rusher in my humble opinion. Again, in an insanely deep TE class I think the 49ers would be wise to look for an upgrade to Celek on day 3. Nina and Earl Thomas – the Texas native and #Seahawks star free agent safety who has for a year been a #Cowboys target – are in Austin and have enrolled their children in school there. DeForest Buckner not included in PFF’s the top 101………..seriously? For me, this one isn’t close. It’s Bosa. It has nothing to do with his name, it has to do with his ability. He is a technician, and he is explosive and violent in a way that Allen isn’t (not talking about pure tangibles). He uses his hands well, he has an array of moves, and he’s good against the pass and the run. He doesn’t have elite bend, but he manages to dip around the end just fine nonetheless. Allen is probably more physically gifted, and is likely miles ahead playing in space, but he isn’t close to the pure pass rusher Bosa is. Allen is the ‘tweener, not Bosa. He’s more of a SLB than a LEO, in my opinion. Now, I think he could be a very good SLB early on, and he might develop into a great LEO, but I think that development is too uncertain to justify the #2 pick. How many freakish athletes with poor or mediocre fundamentals at DE (and other positions) have gone high in the draft and haven’t panned out? Despite the sack and pressure numbers, Allen isn’t a great pass rusher. Yes, he has some bend around the edge. But he won in college primarily through a combination of scheme and athleticism. He moved around the formation and often came in unblocked or avoided the OT. He’s a talented player, but he is lacking in technique and strategy. If he doesn’t win with his athleticism, he doesn’t have much of a counter. As said, he COULD develop this. But unlike a lot of pundits out there, apparently Grant included, I’m not willing to take for granted that a guy who didn’t develop a pass rush repertoire in four years of college will suddenly do so in the pros. There was speculation that Kingsbury would draft Kyler Murray, but he just affirmed that Rosen is his QB. That means, if all the pundits are correct, that they will pick the best player in the draft, Nick Bosa. Since the Niners may miss out on Bosa, they should trade back with a team who wants to leap ahead of all the other teams, to select the QB they covet. If Kyler Murray runs a 4.38 forty, he may be the first QB taken. I speculated that the Raiders may trade up to take Murray, then trade Carr to the Skins or Dolphins to recoup those picks, but maybe the Jags are the most likely trade partner, since JL will not want to do any favors for the Raiders. Jags need to move on from Bortles. Dwayne Haskins is coveted by the Giants, who pick ahead of the Jags. Both Murray or Haskins would be huge upgrades from Bortles. Jags have additional third and 7th round picks. For the Number 2 pick, the Jags could offer their first, second third and 7th round picks, and throw in a 2020 second round pick to even up the trade value chart points. The Niners may miss out on Josh Allen by moving back, but if enough QBs go early, he may still be available. If not, Clelin Ferrell, Jachai Polite and Montez Sweat would still be good options. If people like Grant scream it loud enough that Bosa can’t bend and that Allen is better, maybe the Cardinals won’t draft him. I think the Combine will showcase his talents, or expose his weaknesses. 71 days 21 minutes 38 seconds until we find out if the strategy works or not. Anybody but Bosa! Don’t use a pick this high on a player coming in with injuries and sat out most of his final year intentionally! Between his brother’s injury history and his current situation I say hard pass! If we do draft him I hope that he proves me wrong but I wouldn’t risk it! Also haven’t we learned our lesson with this from the past? I say trade back and try to get the Giants to give us Beckham to switch picks with them or convince the Jags to give us Ramsey and a 3rd to swap! Either of these trades would make sense to me because we could address 2 needs with 1 pick! This draft is loaded with edge rushers not coming off of a major injury. Lets push for a legit edge rusher in FA and I would love to see the honey badger on the back end! Then trade back and get a good pass rusher at picks 4-10 depending on who we trade with! Imagine the defense with Clowney (dreaming), Honey Badger(possible), and Jalen Ramsey(fingers crossed) then we add another legit pass rusher in the draft! Get a good inside LB in the second round, then get Jimmy G some toys and lets do this! I definitely wouldn’t be mad if we went after Tyrell Williams in FA either! John Lynch get your @$$ on the phone because I would love to have that playoff ticket charge added to my season tickets this year! GO NINERS BABY! !